Over one million Indians participated in World War-I, of these about 74,000 died and 67,000 were seriously injured. 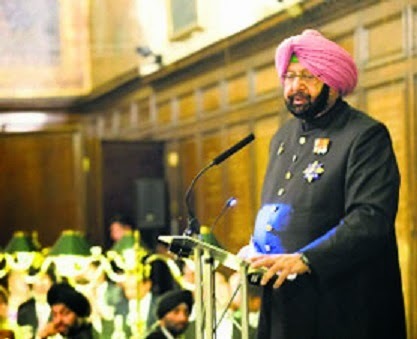 Yet, India's contribution and role in the big war has remained grossly understated, said Congress deputy leader in the Lok Sabha Captain Amarinder Singh while addressing a gathering at the Royal Hospital Chelsea in London on Wednesday evening. The event was organized in memory of the Indian soldiers who participated in the Great War and laid down their lives. "Even today this is a largely untold story of how over a million volunteers stepped forward and helped change the outcome of the war. It is a contribution that can neither be overlooked nor ignored," he said. The former Punjab chief minister said, "Of the 1.3 million Indian soldiers, 74,000 died in battle and 67,000 were severely wounded, many later dying as a result of these injuries." Amarinder disclosed that India contributed most volunteers than any other British colony in WW-I. "The Sikh contribution was particularly notable, making up 22% of the whole Indian Army at the beginning of the war, despite making up less than 2% of the country's total population," he noted. "Many of the soldiers who left India's shores weren't aware of the reasons for the conflict. They fought and died for the honour of their country and the regiments whose colours they proudly served. Tragically, many sentries on duty in France in the coldest winter of the decade (1914/15) were found frozen to death at their posts at night," he revealed. Giving various others details, he said, during WW-I, two regiments of Indian Cavalry-- the XXth Deccan Horse and 29 Lancers Deccan Horse --served with distinction and were awarded several battle honours. Awards to the officers and men included Victoria Cross (1), Distinguished Service Order (10), Military Cross (13), Bar to Military Cross (1), Indian Order of Merit (14), Order of British India (11), Indian Distinguished Service Medal (55), Indian Meritorious Service Medal (98) and Mentioned in Dispatches (14). Guests at the event London included Field Marshall Sir John Chapple, Lord Singh of Wimbledon, and Paul Uppal MP representing the UK government. Event patrons Major General Peter Davies, Major General Peter Currie and Major General M S Sandhu were also present.